Looking at this picture of a Mountain Lion makes one realize how similar the facial features are to that of your typical household cat but the Mountain Lion is much larger and ferocious. In the wild of Vancouver Island in British Columbia, Canada, if you are hiking through the forested areas do not be surprised if your paths cross with one of these magnificent animals. A mountain lion would prefer not to have any contact with humans but on some occasions that seems impossible. 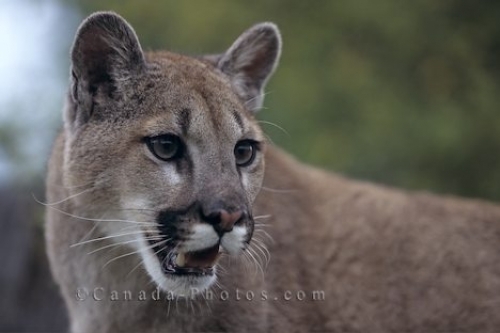 Picture of the face of a beautiful mountain lion in the wilderness of Vancouver Island in British Columbia, Canada.